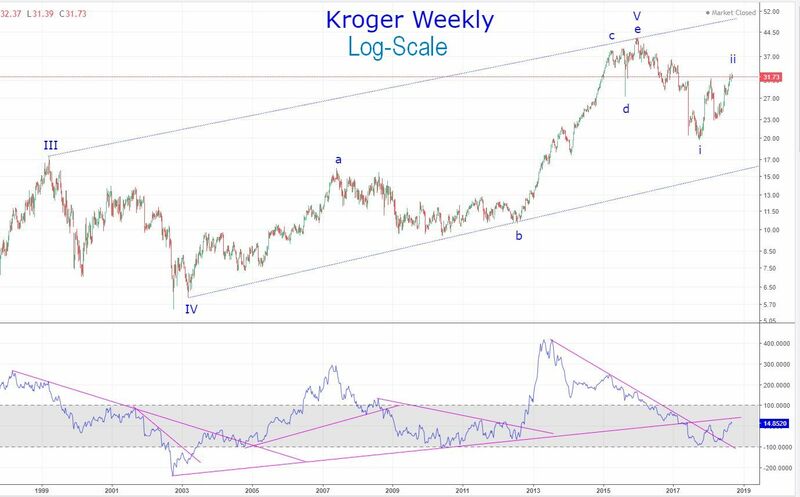 Tomorrow Kroger is supposed to report, so I took a looksy and by my momentum work, KR has already entered into its bear market and is presently in a bear market rally... I have upside targets of ~31.61, which has already been met, and a second, higher target of ~34.24, that I do not think will be hit, but as always... twt. I know we don't care about fundamentals but FWIW, I wouldn't write Kroger off. They are not lying down on the job. I'm not sure what you thought I was implying... Kroger does annual sales of $122B, with a gross profit of $27B. I was only making an observation about a chart - that's it. If you want me to stop, just say so. Goodness, Tim! No! I thought it was good analysis! I'm just offering a tangential fundamental observation--context, if you will, for interest's sake and perhaps as a bit of caution to anyone who might get too Beared up on it.